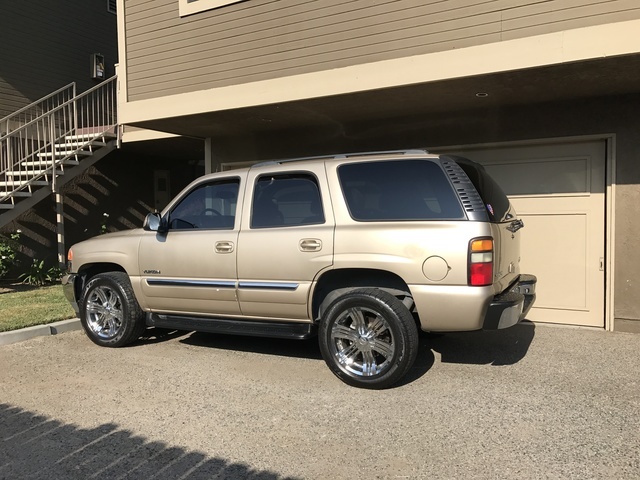 Looking for a Used Yukon in your area? CarGurus has 19,036 nationwide Yukon listings starting at $1,800. The biggest additions to the GMC Yukon SUV for 2005 came from new Stabilitrak and touch screen navigation. Otherwise, GMC added a couple new exterior colors for your viewing pleasure. This domestic vehicle comes in 5 trims: the SLE, SLE 4WD, SLT, SLT 4WD, and Denali AWD. The Yukon offers a powerful set of V8 engines, including 4.8 L, 285 hp and 5.3 L, 295 hp models. All trims have 4 doors and room for 8-9 passengers. Gas mileage generally comes out to 15 mpg in the city and 20 on the highway. The 2005 Yukon can tow nearly 8000 lbs. and gives you nearly 105 cubic feet of cargo space with the second row folded and the third row removed. Overall, the Yukon certainly pulls its weight in the eyes of its drivers with its spacious interior and strong powertrains. However, interior and body materials need to improve. Pick up an '05 for a relatively modern and affordable make. However, if you need the most recent edition, pay extra and go for the 2007 Yukon. What's your take on the 2005 GMC Yukon? GuruD4KL7 I just baught a newer Yukon Denali. Have you driven a 2005 GMC Yukon? New battery and new starter. When the truck sets for liltle while having trouble startin. What could it be ? Got a 05 gmc yukon wont start..wants to turn over but it won't I have pressure on the fuel rod . replaced the ignition switch and still nothing I'm at a loss Idk what else it can be..